Anxious? Then Click Here to Recalibrate! Bills. Work. The kids. We are bombarded with situations and things that fester worry and frustration in our lives. Amy Simpson, professional and personal coach and author of Anxious: Choosing Faith in a World of Worry, talks with us about how to identify if you’re a victim of worry and just how detrimental it can be to your life’s purpose. 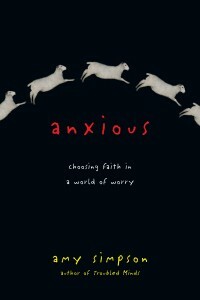 4word: What inspired you to write Anxious: Choosing Faith in a World of Worry? Amy: It was my own story. A few years ago, I had a series of experiences, intertwined with encounters with God, that caused me to recognize the problem of worry in my life. I was a highly anxious person, but I didn’t see myself that way, because I was so used to a certain level of anxiety. I didn’t notice the worry until it got bad enough that I couldn’t ignore it. I would start shaking or feel sick or snap at people for no reason and would recognize that I was worried. But I was actually worried all the time. And I didn’t have an anxiety disorder or another problem that made this impossible for me to control, as some people do. That’s different. These weren’t symptoms of something malfunctioning in my body or mind; they were symptoms of a need for spiritual change. God really challenged me to see this worry and to see it as a problem. My family and I went through some stressful times that called for big gusts of faith, and my worried heart was revealing my lack of true trust in God. You could say Isaiah 40 is my inspiration for writing Anxious, because I remember sitting in church, hearing verses from that chapter and feeling absolutely overwhelmed by God’s proclamations of strength and loving care: “‘To whom will you compare me? Who is my equal?’ asks the Holy One” (Isaiah 40:25). I realized for the first time that the God I had believed in my whole life really was so much bigger than anything that worried me. He really could be trusted so completely that I could actually let down my guard and my backup plans, my worried musings, and sleepless nights. I was refusing to exercise that kind of trust. I couldn’t have changed this on my own — just chosen to be a less worried person. The real change had to happen in my theology. Our behavior always reflects our beliefs, so we need to let God transform what we believe and the way we think. I’ve seen that play out in my own life. 4word: What are some common causes of worry in today’s world? Amy: We have so many triggers. We’re literally surrounded by reasons to worry. Many of us worry over little stuff like gaining a couple of pounds, flight delays, and watching our team lose the big game. It’s relatively easy to dismiss those worries. But we have plenty of big causes for worry, too. Unemployment and economic woes cause people to feel insecure, wars and terrorism plague us, famine and disease continue, people live in spiritual darkness, and we can never say with 100% confidence that our children are safe. When I was writing this book, and I asked people about their worries, the most common responses I received were about finances, work problems (including the threat of unemployment), and kids. We have an inaccurate perspective on God and our relationship to Him. We are trying to live in the future (which is God’s domain only). We are clinging to people and possessions that don’t really belong to us. Anxious addresses all three of these problems and encourages readers to get at the source of worry by changing their perspective and welcoming God’s transformative work in their beliefs. 4word: What led you to become a personal and professional coach? Amy: I was led to coaching by my love for people and helping them grow. In all the leadership roles I’ve played, I have always found great joy in looking closely at people, listening to them, helping them see their own potential, and supporting them as they develop more and more into the people they were created to be. I’m a tremendous believer in living with purpose, and I think everyone should be guided by an internal sense of direction calibrated according to the unique person God has made them to be. God didn’t put us here to waste what He has given us — we don’t have the right to do that. Most people don’t take the time to sit down and consider their unique purpose, why they make the choices they do, and how they can make the most of this life. Without considering these questions, many of us are simply reacting to the forces around us, allowing others to steer us where they want us to go, making choices simply because they seem easiest at the time, or we don’t know what else to do. As a coach, I get to help people ask themselves those questions—and find answers. It’s extremely rewarding to see people make new discoveries, find the courage to acknowledge what’s true, become unstuck, and move forward personally and professionally. 4word: What type of people do you enjoy coaching the most? Amy: I specialize in coaching leaders, pastors, writers and other creative people, people in transition, entrepreneurs, and people who have family members with mental illness. But I’ve been trained in a coaching model that works with anyone who’s motivated to move from where they are to where they want to be. I really enjoy working with people who are ready and willing to engage in the process, and exercise the courage required to shake up the status quo. 4word: What are some reasons people seek a professional or personal coach? Amy: People often seek a coach because they’re dissatisfied with one or more aspects of life and are looking for some help in changing it. That dissatisfaction might be professional or personal. It might be very clear what they want to change. Or it might be something they can’t quite put their finger on. Coaching can help either way. People also seek coaching because they’re in transition, and they want someone to support them in making the change in the best possible way. Other times it’s the opposite—they feel stuck and need someone to help them get moving again or look at the situation in a new way. Coaching helps people move from where they are to where they want to be. Sometimes that means I help people discover where they want to be. Other times they know exactly what changes they want to make, and they need someone to help them move in the right direction. Either way, the coaching process evokes transformation. It’s not enough to simply make a list of goals and start checking them off the list. We’re going to learn along the way, and the client is going to grow. 4word: Any parting words for our readers? Amy: Earlier I mentioned that I’m a huge believer in living with purpose. I feel this must be the case for every Christian. We are not put here simply to get by, to do what everyone else is doing, or even to be happy. We are meant to leave a mark on this world—each and every one of us. That’s part of what coaching is about. But it’s also part of what Anxious is about. Worry gets in the way of living with purpose. While the world around us is convinced that being worried is a sign of being responsible, engaged, and important, we are called to live differently. That leaves a mark on this world. We are called to be people of peace as well as purpose. I should also mention that I am accepting new coaching clients, and I coach most clients by phone, so geography isn’t an issue. I would love to hear from anyone who might be interested in working with me. You can contact me through my website. Worry is something that every human on Earth struggles with at some point. Before you let worry divert you from leaving a mark on this world, consider Amy’s list of worry triggers, and see if you are being influenced by one or more of them. Consciously move yourself onto a more trusting life path and see what God can do with your life once it is worry-free. What are some areas of worry that you need to address in your life? 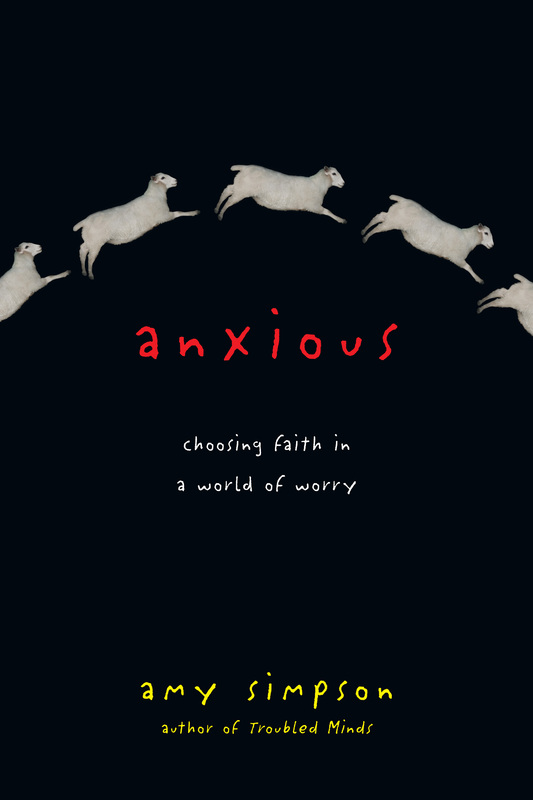 Amy Simpson is author of Anxious: Choosing Faith in a World of Worry (InterVarsity Press). 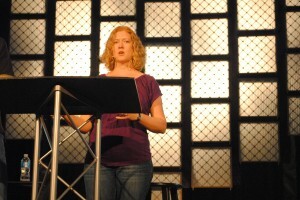 She also serves as a Co-Active personal and professional coach, editor of Christianity Today’s Gifted for Leadership, Senior Editor of Leadership Journal, and a speaker. 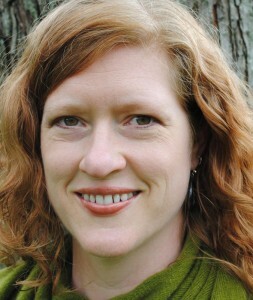 You can find her at AmySimpsonOnline.com and on Twitter. Want “Wednesday Interviews” sent directly to your inbox every week? Click the button below to sign up!